Espresso Allegro (ORG) -Sample-3 oz. Espresso Allegro (ORG) -Small-14 oz. Espresso Allegro (ORG) -Regular-30 oz. Espresso Allegro (ORG) -Large-40 oz. Espresso Allegro (ORG) -Bulk-80 oz. 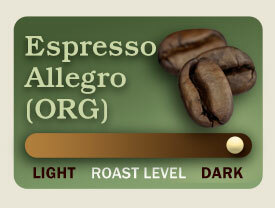 Our new Organic Espresso Allegro is a dark espresso blend. We formulated a secret combination that will make fantastic espresso, intense, dark cocoa, dark brown sugar yet smooth on the palate. Will hold up well to milk. Although presented as an espresso blend, it is an outstanding drip brew. This is a great option for coffee shops to use both as their organic espresso and as a dark roast drip blend.